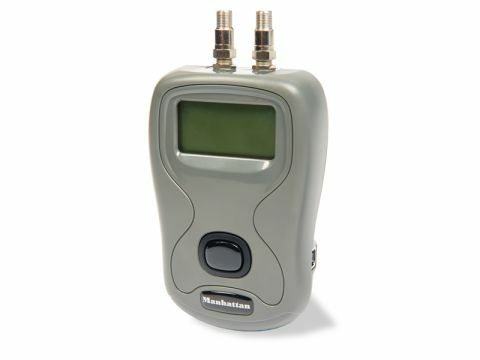 Manufactured by Horizon and sold under Eurosat's Manhattan brand name, the DSM-4S has to be the simplest digital satellite meter we've seen. It's as easy to use as the basic signal-level meters that sufficed in the analogue era, only a lot smarter owing to the inclusion of modern-day microprocessor wizardry. As with the older generation of meter, the Manhattan DSM-4S is inserted between the dish/LNB and the host receiver – its power is taken from the receiver's LNB supply. In contrast, the variety of meter used by the average professional installer is typically powered by an internal battery pack – which they must always remember to charge before going on a job. Two standard 'F' connectors provide these connections, a patch cord being supplied for the meter-to-LNB or receiver-to-meter connection (which you choose will be determined by whether you're using the DSM-4S indoors or out). Also supplied is a flimsy carrying case, complete with belt-loop for 'up-the-ladder' convenience. Sure, this case may lack the hard-wearing build quality of the ones supplied with professional meters, but the DSM-4S isn't intended for day-to-day professional use. It's ideal for those with portable camping-type systems, or anyone who wants to regularly check that their dish is in alignment. We should point out, though, that supplier Horizon Global Electronics does sell such meters. It could therefore be argued that the DSM-4S has a strong heritage. And it certainly looks the business – a compact and robust grey-cased unit with a single moisture-resistant push-button control and a large backlit 128 x 64-pixel graphical LCD panel. Select the satellite you want – the tactile button cycles through Astra 2A/2D (28.2°E), Astra 1x (19.2°E) and Hot Bird (13°E) – and an eight-step bar graph indicates the signal level. No bit-error rates or dBm readings here – the DSM-4S is intended exclusively for consumer use. Enthusiasts would no doubt welcome a wider choice of satellites, but to do so would make the DSM-4S more awkward to use. You would forever be pressing that button until the obscure bird you're after appears on the display. Lest we forget, the satellites it does cater for account for the lion's share of European viewing. When a valid signal on the selected satellite has been detected, the DSM-4S emits a tuneful series of bleeps and tells you it has been 'found'. It's then a case of tweaking the dish for maximum signal on the bar graphs. A series of four 'countdown' arrows provides some kind of indication as to whether you're moving closer to or farther away from the target satellite. This approach is intuitive and works exceptionally well. The manual describes in a friendly manner the basics of satellite dish alignment – azimuth (rotation), elevation (raising or lowering the dish reflector) and skew (rotating the LNB in its holder). The meter's outward simplicity cloaks its advanced design. For a start, a USB port (and a PC connecting cable) is provided for updates. This arrangement can also be used to load alternative firmwares catering for different batches of four satellites – these are available on Manhattan's website. Inside the DSM-4S is a Sharp tuner of the kind you'll find at the heart of regular digital receiver (or installer's meter, for that matter). Just like a professional meter, then, the DSM-4S looks for specific transponders on the target satellite.